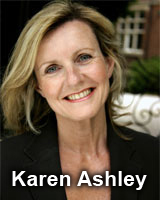 Karen Ashley (BA Hons, Dip CAH, MasterNLP, PEFT, CI, MNCH) is one of the UK’s leading hypnotherapists. She is a specialist consultant in Advanced Clinical Hypnotherapy based in Wilmslow, Cheshire. Karen is also a qualified Counselor and Coach. In this, what sets Karen apart is her ability to combine Hypnotherapy, EFT and select NLP techniques – far more effective than hypnotherapy alone – to get the best possible results with each client in the shortest possible time. Karen’s therapeutic career began in 1994 and she has continued her personal and professional development by constantly updating her knowledge and skills through many courses and seminars, and by continual study. This ensures that you always receive the very best treatment and latest techniques. Indeed, so much so that Karen, as a Certified Trainer in both Hypnotherapy and EFT, now trains other therapists in workshops and training courses across Cheshire. The depth of Karen’s therapeutic knowledge for getting the results her clients want is augmented by her breadth of life experiences and challenges: such life-experiences facilitate the empathy required to get to the bottom of what is really underlying problems. Such experiences include the challenge of bringing up two children whilst juggling a full time degree and a successful sales career, starting up and running her own large hotel for many years, advising at the CAB (Citizens Advice Bureau), teaching GCSE and A Level English to adults and the wealth of knowledge and understanding gained from an extensive career as a therapist. Well, that’s the ‘official’ bit over, so how can I help you? My passion is people and I love my work! And what I am very good at is moving people from wherever they are ‘stuck’ in their lives to a much better place where they have let go of fears and anxiety, can create the things they want and ultimately, can achieve their goals. This enables them to live a happier, more relaxed lifestyle feeling confident about themselves and their future. Seeing the difference in clients as they leave their first session is wonderful – they look more relaxed, their energy has changed and I can hear the optimism in their voices because already they feel so much more positive about themselves. We can’t change the things that have happened in our lives but we can always change the way we feel and respond to them. The difference this makes is amazing because we quickly begin to feel more in control of ourselves and situations, become more confident and decisive and feel better about ourselves in so many ways – regardless of the circumstances. You too can achieve anything that you want to achieve and my job is to help you do just that. Using my creative coaching and personal development techniques and combining them with hypnotherapy and EFT you will quickly begin to feel optimistic and more positive as you move towards your goal. You see, not only do I see results everyday in my clients but I am speaking from personal experience. For many, many years I had a very debilitating phobia, but using my own techniques I am now completely free of it. The difference it has made to my life has been incredible. Even now, many years later, those who knew how I used to react still cannot believe the transformation. If you want to know more then read the full story on my Cure Phobias page. So how can I help you? Karen offers EFT and hypnosis therapy to clients throughout the Cheshire and Greater Manchester area. This includes Wilmslow, Alderley Edge, Mobberley, Chorley, Mottram St Andrew, Macclesfield, Peover, Tabley, New Mills, Altringham, Cheadle, Stockport, Poynton, Prestbury, Buxton, Middlewich, Northwich, Knutsford, Winsford, Lymm, Manchester, Salford, Trafford, Sale, Bowdon, Hale, Cheadle Hulme, Bramhall, Heald Green, Gatley, Marple, Congleton, Leek, Ruston, Tatton and the surrounding areas.